No, Sony hasn’t released a 3D-capable PSP console yet. However thanks to a piece of software called PSP3DPlugin for the PSP console written by a German guy going under the nickname of PSPWizard you are able to play some games in anaglyph 3D mode. This plugin however requires you to have a modified PSP console with custom firmware, allowing you to run homebrew software as it is not official software and is not supported on non modified consoles, so you may not be able to run it on just about any PSP. Also have in mind that the software will not convert all games for PSP into stereoscopic 3D mode for use with a pair of anaglyph glasses, but only some games will work. 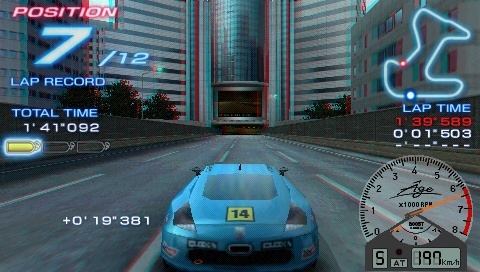 The example anaglyph 3D screenshot above is from the game Ridge Racer 2 that works quite well with the PSP3DPlugin, it is for anaglyph 3D glasses with red-cyan color filters, but the plugin also supports green-pink (magenta?) and yellow-blue color filters in both this order and in reversed order of the color filters. To install the PSP 3D Plugin you can download the package I’ve provided for you from the link below and extract the contents of the archive in the main folder of the memory card you use in the PSP console. You need to preserve the exact folder structure in order for everything to work and after you extract the required files you need to reboot your console. If your console does not have a custom firmware installed that will allow you to run homebrew software, then after the reboot nothing will change and you will not be able to use the plugin. 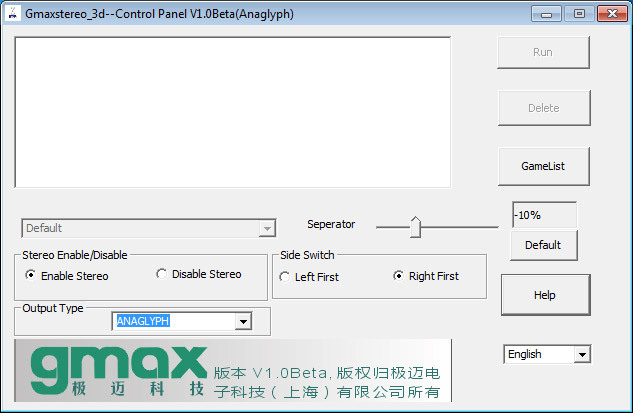 But if the console is with a CFW that allows you to run homebrew, the 3D will be loaded and you would be able to activate the anaglyph 3D mode in games (it will work only in games, not in the console’s menu for example). In the package below, besides the 3D plugin, I’ve also included a software that will allow you to capture screenshots from games, this software is also a homebrew and will require a modified console and it can capture both normal 2D screenshots as well as anaglyph 3D screenshots that you can easily transfer to your PC and share. The screenshots are being saved on your Memory Stick in the PSP folder under SCREENSHOTS with a separate folder created for each game (screenshots are saved in BMP format). You can also preview the screenshots you take from the Photo menu, when you open the Memory Stick menu you will see folders with the names of each game you have taken screenshots in. After installing the 3D plugin on your PSP console you are able to call an additional menu, like the one you see on the photo above, so you can adjust the 3D effect while in game. By default the key assigned for activating and deactivating the anaglyph 3D mode in a game is the key of the console with a note on it (the one left from the Select button) and with the display key (the one left from the note key) you can capture screenshots in games. When you are in a game, in order to call the extended menu you see shown on the photo above you need to hold the Start button pressed down for about 5 seconds. 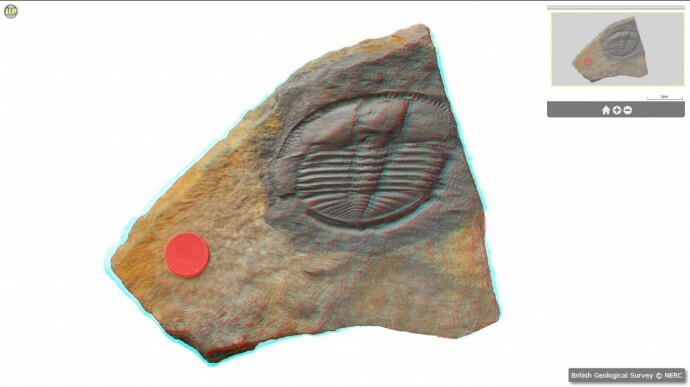 This extra menu allows you to also enable/disable the 3D mode, change the color filters used in the anaglyph glasses, and tweak the level of the stereoscopic 3D effect. There are two settings available for adjusting the stereo 3D effect in a game, these are the 3D angle (something like convergence) and the 3D position (something like depth), so playing with these settings you can adjust the volume effect you get in the game. You are free to try different settings for different games and you can save something like profiles, so your settings won’t be lost the next time you run the game. As I’ve already mentioned, not all games support the 3D plugin and not all of these that work will be absolutely problem free, but it is worth trying if you have a PSP console fitting the requirements for the plugin to work. For example the game Ridge Racer 2 works very nice and looks quite OK in anaglyph stereoscopic 3D mode, the game Gran Turismo for example also works with the plugin, however when you activate the anaglyph 3D mode the framerate drops a lot to an unplayable level, so the game is pretty much unplayable. Another example is the game Lego Star Wars III that is apparently not compatible with the plugin and when you try to activate the anaglyph 3D mode in it nothing happens, so you can try and report what games work and what not. The developer of the plugin has posted a short list of games that work for sure and of some that might work, but those lists are not very full and since there are a lot of other games for the PSP out there if you try any of them you are welcome to share your feedback.